Edgewood, B.C. photographer Tasha Hall was out snowmobiling with family, looking for moose to photograph, when they came across the large bird. The eagle was found in a trapper's snare, likely set for a larger animal like a wolf, she said. Hall's family members were able to free the eagle from the trap, in a rescue caught on camera. The video shows two men who'd been with the photographer putting what appears to be a jacket over the eagle as the bird tries to nip one of their gloved hands. The men examine its wing and then picking it up off the ground where it was lying. They thought the bird's wing may have been broken, and that it had lost a fair bit of blood, Hall told CTV News. They believe it had been there at least a day or two. Hall and her family brought the bird home and called a wildlife rescue group for advice on what to do next. She drove the bird to the BC Wildlife Park in Kamloops to be assessed on Saturday. Hall spoke to staff at the facility Monday and was told its prognosis is good. Sean Daley from the Wildlife Health Centre told CTV News that the bird was severely dehydrated when it arrived, and had a large hematoma on its wing. Fortunately there was no fracture of the bones. The eagle was treated with fluids and an anti-inflammatory for pain, and was "force fed to help stimulate appetite." 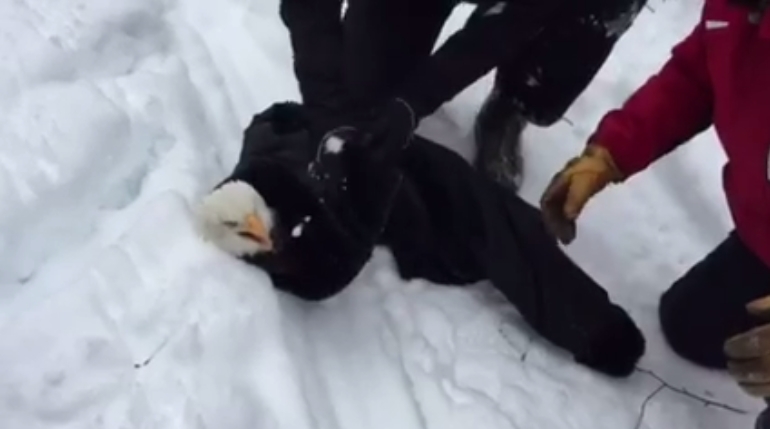 Days later, the eagle is now eating on its own, and staff at the centre are hopeful they will be able to release it back into the wild once it's healed. However, they are still determining the amount of damage to its soft tissue and to the injured wing, so it will take time before they can determine whether it is able to fly well enough to live on its own. 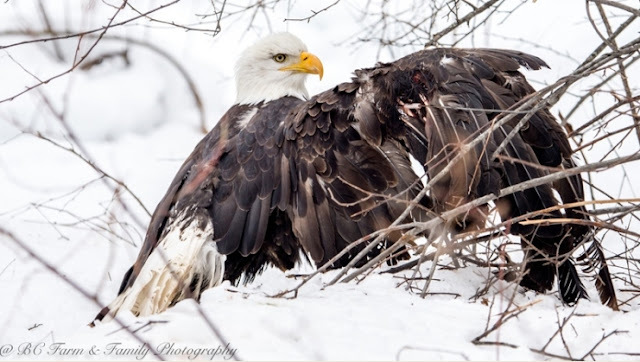 "We were snowmobiling in the back country near our home, looking for moose to photograph when we came upon this Bald Eagle in a trappers snare (most likely snaring for wolves). We managed to get him home, and are currently waiting for wildlife rescue to call us back. How many innocent animals are snared like this? How many animals are left to suffer and die this way? How can this be OK? He looks like he was there for a couple of days at least! The treatment of our wild animals is appalling! " Responses to "A bald eagle is recovering after being rescued from a wolf trap "